I’m starting to see a pattern in my summer wardrobe, I’m wearing a whole lot of ALC and almost everything I’ve bought in the last three months is from Blue & Cream. Not a bad combination whatsoever! Here’s the thing about it, when I find a line that I love, that’s chic, versatile, and fits me well, that’s all I need, and a store the carries a line and just happens to be run by two friends, Jeff and Sam, well it’s obviously a match made in heaven. After lots of rain and terrible humidity, New York weather calmed down yesterday to make for a gorgeous summer sunny day. I decided to debut a dress that I purchased a few weeks ago at Blue & Cream. 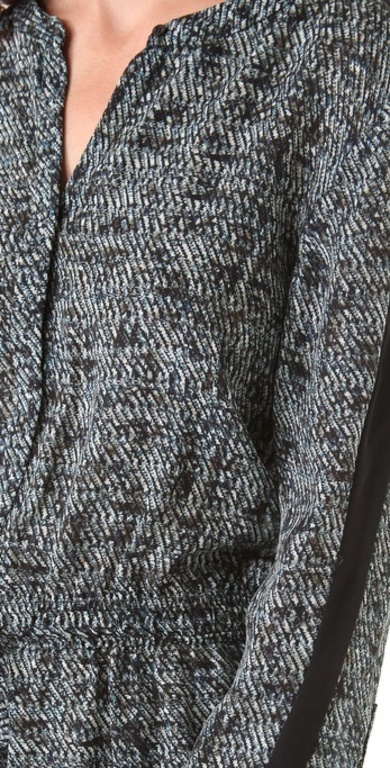 The ALC Hanna Dress is a beautiful black, brown, and grey pattern, made from silk, and while it is a tad shorter, made so by the tie at the waist, the long sleeves balance the dress out making for a work appropriate look. I decided go with simple black Tkees (these days my favorite footwear), left it at that. If the dress is powerful, which this ALC dress is, than accessories shouldn’t really matter. Especially in the ever changing weather of New York summers simplicity is the key to dressing for success, and not sweating it out of course, xo.